I've had a migraine the last few days, and sadly I had to miss church on Sunday. 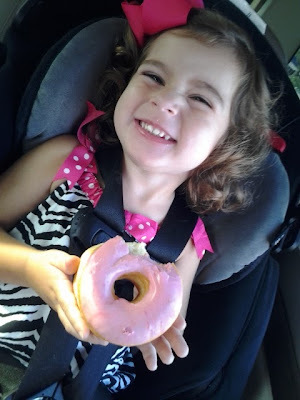 While I was at home I got an email with several pics of Katie enjoying a donut and some princess bubbles! It was from our Children's minister, Lisa. Apparently, Katie's Sunday School teacher was gone, and that did not sit well with her! She lost it, and Lisa took care of her! It's not the first time. Katie has been known to be a little high maintenance in the nursery. And they always take such good care of her. I appreciate them so much! Well today, Katie got a surprise in the mail from Ms. Lisa! Isn't it so cute? We think so. Katie kept saying "it is so cute" over and over and over! She wanted to test it out with her cowgirl hat too! She asked to sleep in it, but I convinced her that was probably not a good idea. It's laid out right by her bed, so she can put it on first thing in the morning. Lisa is the sweetest! She is super talented too. She's been sewing children's clothes and costumes for years. Her website is here. 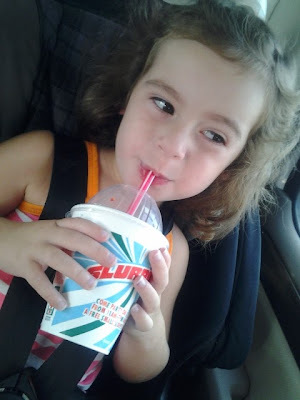 So since I had a migraine this weekend, Katie and I had to get a Slurpee. It was for medicinal purposes only! They really do help! And we didn't have donut Friday, but donut Saturday. It's OK to switch things up a little! 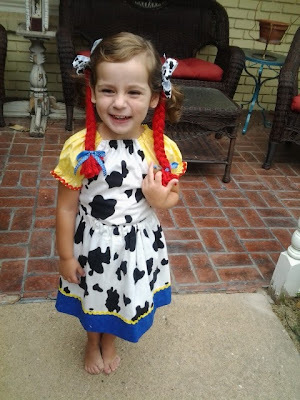 And today was picture day at school, so Katie wore the cute outfit her Aunt Sisi made her! Do you ever order pics from school? We haven't yet. I'm sure it will have a wagon wheel or something cheesetastic in the background. I wonder if she made this face for the photographer? If you ever see a picture of me from age 4 to 7, I will have my tongue sticking out and my eyes crossed! So this is hereditary. At least I won't ever have to tell Katie that shes "wasting film!"